On The Fourth Thursday In November, 84 Million American Families Will Gather Together … And Wonder Why. Claudia Larson is heading home for yet another chaotic and exasperating family Thanksgiving. But a new visitor offers some interesting possibilities. If they can duck the flying turkeys, this romance may just have a chance. 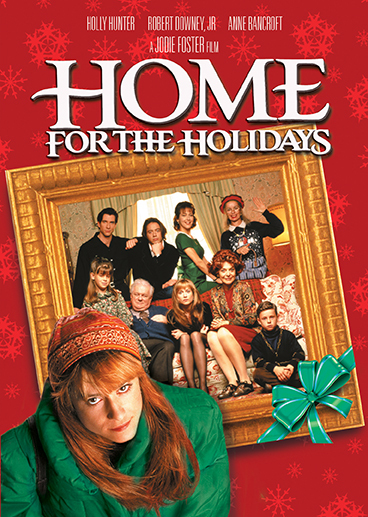 Masterfully directed by Academy Award® winner* Jodie Foster (Little Man Tate), Home For The Holidays boasts an all-star cast including Academy Award® winner** Holly Hunter (The Piano), Robert Downey, Jr. (Chaplin), Academy Award® winner*** Anne Bancroft (The Graduate), Charles Durning (Tootsie), Dylan McDermott (Steel Magnolias), Steve Guttenberg (Short Circuit) and Claire Danes (Homeland).